Hortus Camdenensis | Abelmoschus moschatus Medik. A relative of the okra, the tubers have been used as a source of food. A native of South East Asia it has also been recorded from Northern Australia where it may also be native. Aboriginal Australians have reportedly made use of leaves and tubers as food. The seeds are known as Ambrette Seeds. ‘The seeds contain an oil with a fatty-musky, slightly ambery odour. Its most important odoriferous components are the macrocyclic musks 5(Z)-tetradecen-14-olide and 7(Z)-hexadecen-16-olide, also called ambrettolide. The oil was formerly highly appreciated in perfumery, but has now been largely replaced by synthetic musks. The seeds have a strong aroma of musk, and have been known as grani moschi. Relaxing and stimulating powers are attributed to them; and some cases, apparently authentic, have been recorded, in which they seemed to have a decided influence in casting out the poison of snakes. Possibly a further and more careful investigation of their properties, would show them to be an agreeable and useful article in cases where mild nervous prostration required a diffusible stimulant and relaxant. At present, they seem to be used for nothing beyond giving flavor to the coffee of the Arabs. Seeds are used as an inhalation in hoarseness and dryness of throat. Leaves and roots are used in gonorrhoea and venereal diseases.’ [www.motherherbs.com/abelmoschus-moschatus]. 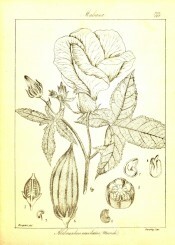 A line drawing is given in Wight’s Icones Plantarum Indiae Orientalis. 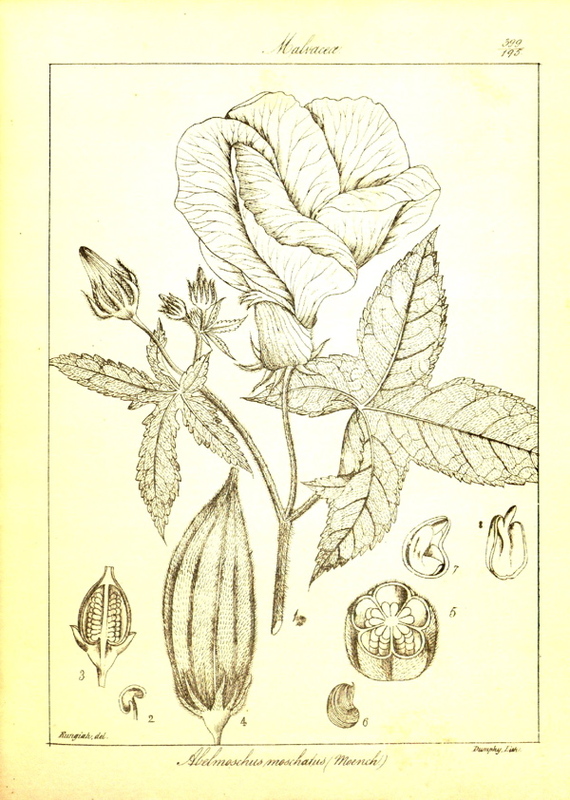 [Wight, Vol.2, p.399/1843].